Driving on any underinflated tire is dangerous and may result in sudden tire destruction caused by excessive heat build-up. 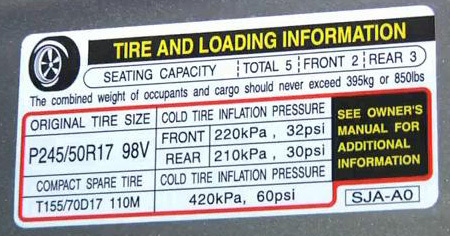 For replacement tires, your tire retailer should provide you with the proper inflation pressure. Otherwise, follow the air pressure recommendation found within your vehicle's owner manual or tire placard in your vehicle. If your replacement tire size is different from the original equipment tire size, ask your tire retailer for a revised air pressure recommendation guide in order to adequately support your vehicle's gross vehicle weight rating. Check the cold inflation pressure in all of your tires, including the spare tire, at least once every week and always prior to long distance trips. 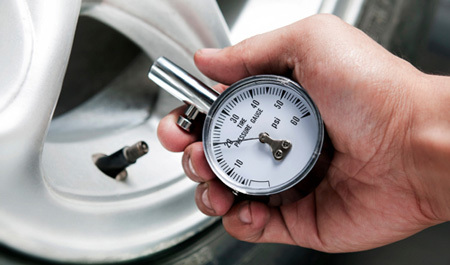 Failure to maintain the proper air inflation pressure may result in improper vehicle handling and may cause rapid and irregular tire wear, reduction in tire durability, loss of vehicle control, or sudden tire failure that may lead to property damage, serious personal injury or death. Never bleed air from hot tires as this may result in under-inflation. Always examine your tires for penetrations, bulges, cracks, cuts and abnormal wear - particularly at the tire edges - which may be caused by, for example, vehicle misalignment or tire under-inflation. Failure to properly control a vehicle when one or more tires are under-inflated may result in an accident. Use of a damaged tire may result in rapid air loss, including sudden tire failure. 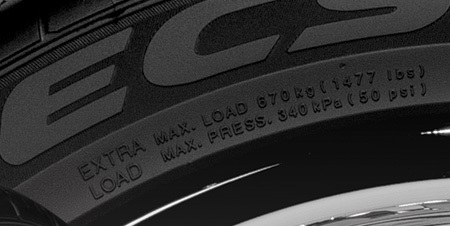 An explosion of the tire/rim assembly may occur because of improper mounting. Only specially trained persons should mount tires. Failure to store tires in accordance with the following recommendations may result in damage to your tires, reduction in tire durability, or sudden tire failure. Tires should always be stored in a cool, dry, clean, indoor environment. Tires contain waxes and emollients to protect their outer surfaces from ozone and weather cracking. As the tire rolls and flexes, the waxes and emollients continually migrate to the tire's surface, replenishing this protection throughout the normal and proper use of the tire. However, when tires sit outdoors and are unused for an extended period of time, the tire surface become dry, the tire may be susceptible to ozone and weather cracking, and the casing becomes susceptible to flat spotting. Surfaces on which tires are stored must be free from grease, gasoline and other substances that could deteriorate the rubber. A qualified technician should check all tires when the Kumho Tire U.S.A., Inc. warranty policy period has lapsed, even if damage is not obvious. Lake Manawa Exit, 1 Block West from Tractor Supply.